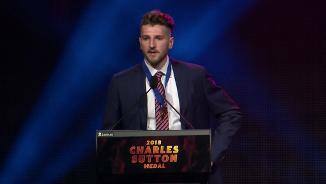 Marcus Bontempelli has won his second Charlie Sutton Medal in as many seasons, finishing just one vote ahead of Jason Johannisen in a thrilling count at Crown Casino on Wednesday night. Johannisen led after Round 8, Round 16 and Round 20 before he was chased down by the 21-year-old midfielder in the final rounds. Bontempelli finished with 185 votes, one vote clear of Doug Hawkins medallist Johannisen on 184 and 30 votes ahead of Gary Dempsey medallist Jack Macrae on 155. The 21-year-old averaged 23 disposals and four marks per contest in 2017 and kicked 20 goals across 22 games. He also lead the club in contested possessions (11.8pg), clearances (90), contested marks (21), tackles (138) and finished second in metres gained (8,474). 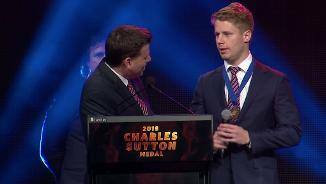 Wednesday’s win saw Bontempelli become the youngest duel Charles Sutton Medallist in the Club’s history, taking the crown from seven-time winner Scott West. West won his second in 1997 and turned 23 in November of that year. Other award winners included Lewis Young who won the Chris Grant Best First Year Player award after averaging 12.9 disposals and 5.4 marks per game in his debut season. Bailey Dale picked up the Tony Liberatore Most Improve Player award after kicking 16 goals over the final ten games of the season, including four against Port Adelaide in Round 22. Caleb Daniel won the Brad Johnson Award for best team player, while Zaine Cordy won both the John Van Groningen Domestique of the Year Award and the Scott West Most Courageous Award. 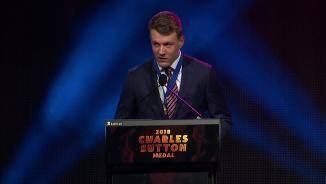 Nick Jamieson (441 votes) won the VFL Best and Fairest award ahead of Will Hayes (408) and Jordan Russell (390.5) while Ellie Blackburn and Emma Kearny tied for the AFLW Best and Fairest. NB. 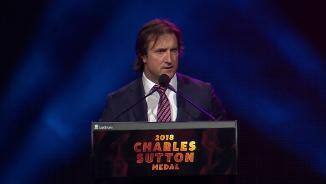 Senior coach and assistant coaches can award up to five votes to any player on the ground following each match.